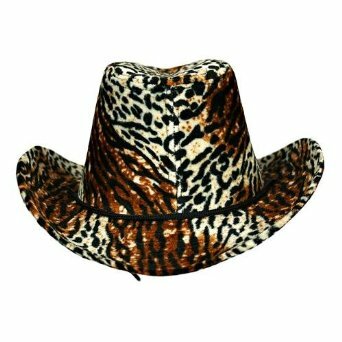 Wild looking and fun to wear, you will surely turn heads in this plush Animal printed cowboy hat. Loaded with tones of brown, black and golden tan colors. Hat has an adjustable chin cord. Hat has a 23 inch circumference. Hat brim is 3 inches wide. Hat crown is 4.5 inches high.